I've been a member for a while but never posted a grow log. My usual garden is too boring for that. I use 20-30 pots and overwinter my mama plants in a hillbilly winter shelter. Our ground here isn't good for in soil gardening and I've not been enthused enough to undertake the work and expense to build raised beds. Now I have my peppers working the way I want and have the need for a much larger grow to supply a project. The main peppers I'll grow will be reaper, douglah and fatalii. 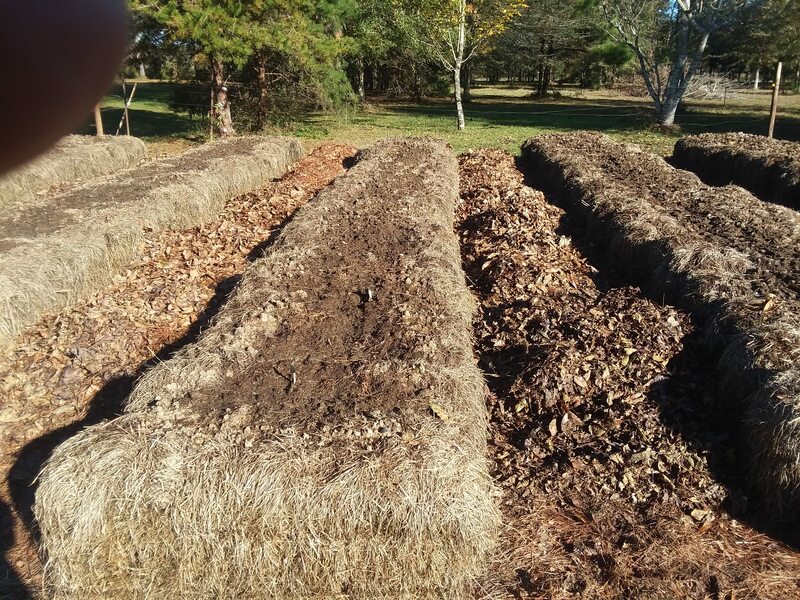 For a couple of years I'll do hay bale gardens and heap tons of organic trash into the area. I have monumental amounts of pine straw, oak leaves and bonfire ash every year to dump in the walkways. I think this will do a world of good to make this new garden area mo'betta for eventual in ground growing. I closed off a 38x38 patch in the NE field that gets full sun. This is the area I chose. The big painted guy is my fertilizer supplier. The little painted guy is my running buddy and load inspector. 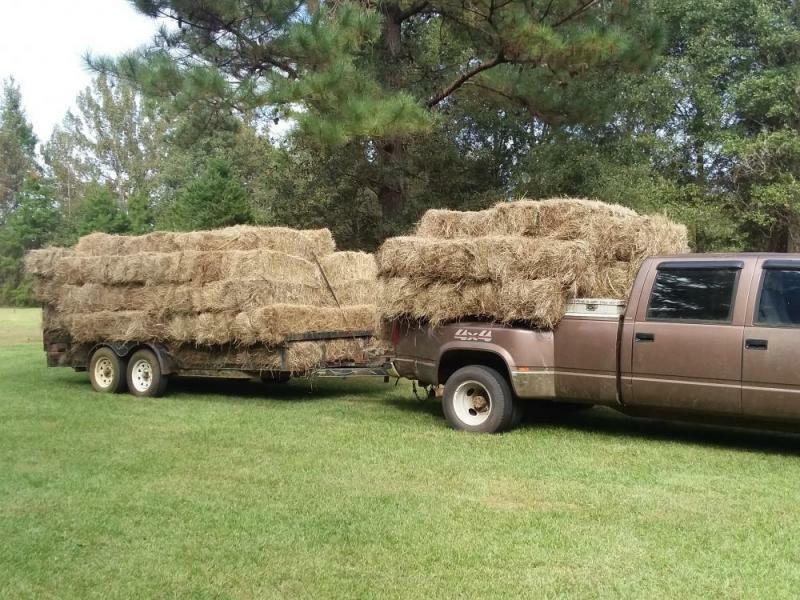 Wednesday, Cody and I went to Pensacola and picked up a load of last year's Pensacola Bahia bales for $1.85 each. Easy load. The farmer dropped them out of the loft on my trailer and I stacked them. The unload, stack and stage was a bit more work. The bales are huge. Some are over 5' long. This made me revisit my layout a bit but wound up with 4 rows of 24 and one row of 12 that I'll fill in later. The walkways are 4' wide. Rather than the usual 12-15 day period allocated for bale conditioning, I have 120-150 days to work with. No big hurry but since we're supposed to have some rain coming in soon, I added a half cup of ammonium nitrate to each bale yesterday morning and started top dressing the bales with well aged horse pie from the field. It takes about 12 cf per row to dress the bales like this. Interesting setup and very professional, looking forward to following your thread! 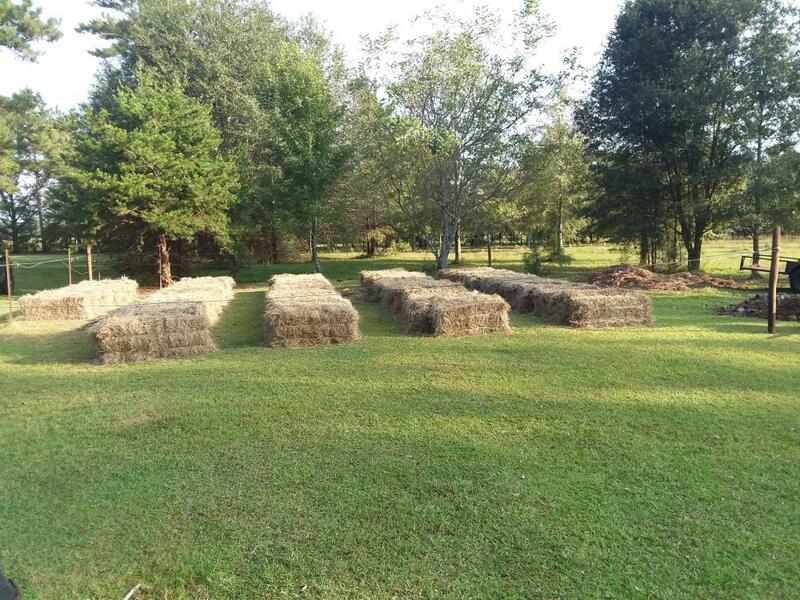 We got the rest of the bales top dressed and added the first layer of mulchy stuff to the walkways today. Need to round up more mulch quicklike. It's still mowing season and I don't have a mower that fits through there. 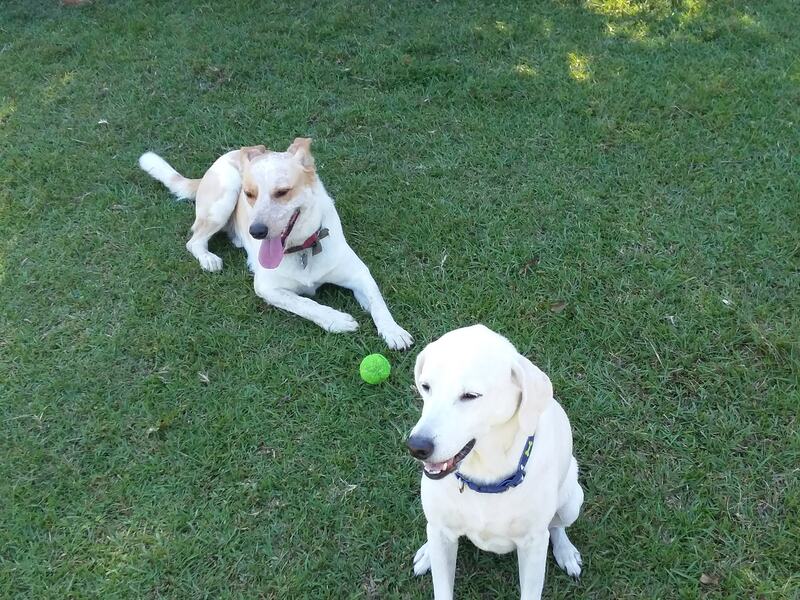 My crew taking a break. I think it will do nicely but will require a lot of water. The good part is well water is virtually free. The bad part is our pipe-eating >6.0 pH water must come from the pumphouse (at the distant arrow) while the much more convenient neutralized water (close arrow) is far too high for a pepper garden. Oh well, when I ran the field pipes 20 years ago, I didn't know our water was so acidic so I just tied into that at the house feed. A couple years later I had to install the neutralizer tank to bring it up above 7.0 pH. I'll be following this one! I fed the bales some more nitrogen the other day before our regularly scheduled 2" Thursday rain event. Yesterday was the third consecutive week we had the Thursday gullywasher. 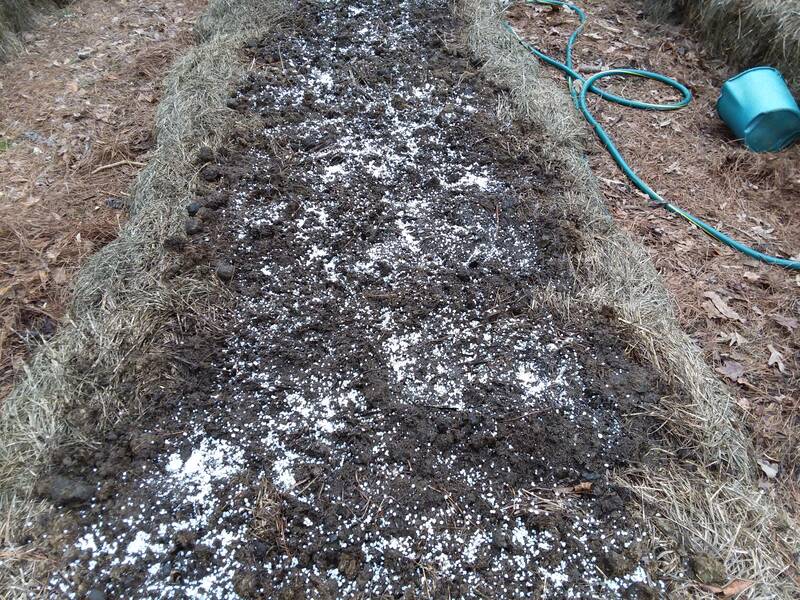 The horse manure is starting to melt down into the bales nicely. 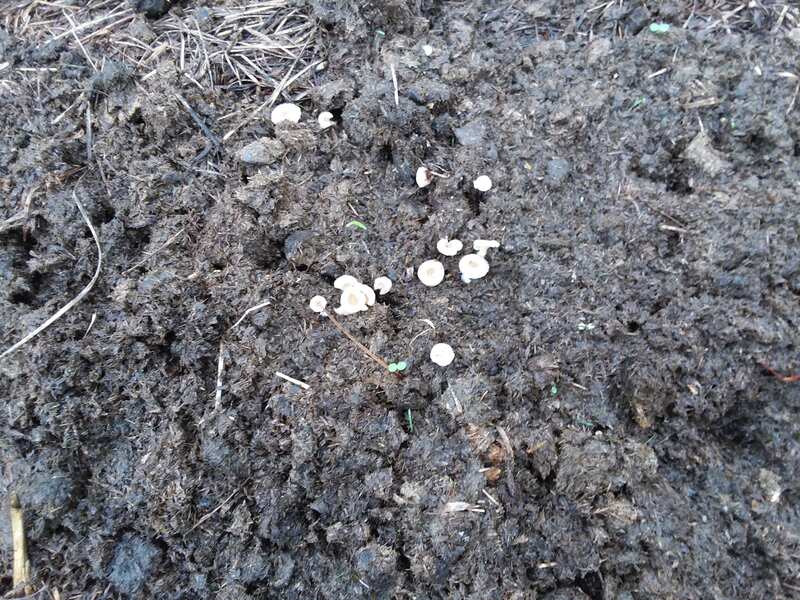 We have several varieties of mushrooms growing from many areas on the bales. Anybody want to try some to see if they're the "right" kind? 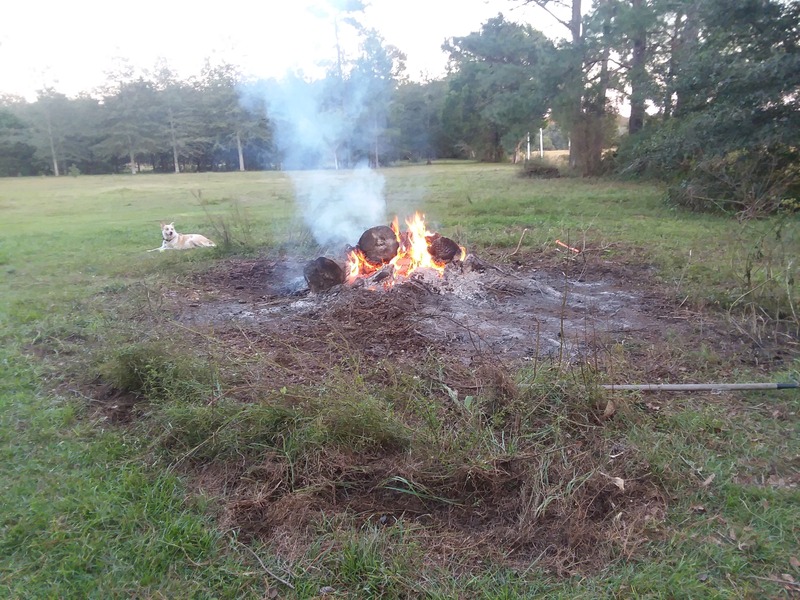 We burned a small firepile to make some wood ash Saturday before last. Not sure what I want to do with it. Still have the big pile to burn. Just an observation from my experience with growing in bales (very limited) 150 days until planting time is quite a bit. Those bales will continue to break down from now until planting time, even more so once planted and watered more regularly. 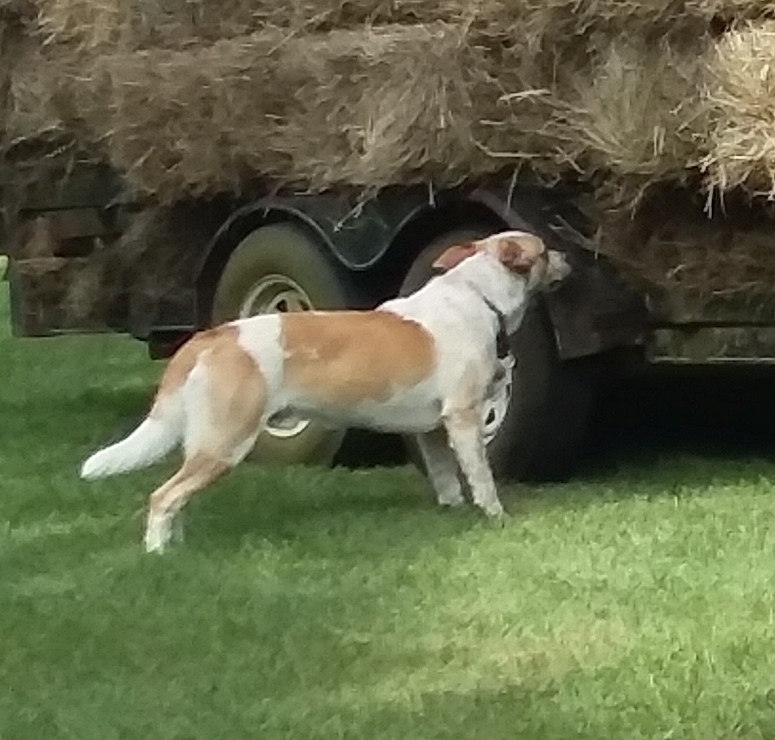 You may come to find by mid season or even earlier depending on decomp rate, that those bales are "melting" and completely falling apart. Its natural for them to lose shape as times goes on, and in our long CA growing season it did become a challenge. Maintaining a viable planting medium could be difficult for a larger size pepper plant. Again, just an observation from my own experience. I will be following along, good luck to you! Edited by NorCaliente916, 09 November 2018 - 04:52 PM. Anybody want to try some to see if they're the "right" kind? You need to take a spore print too. Thank you very much for sharing your experience and expertise. This is something I'm anticipating to some degree but I'm hoping the bale system doesn't turn into a mound system before it's all done. 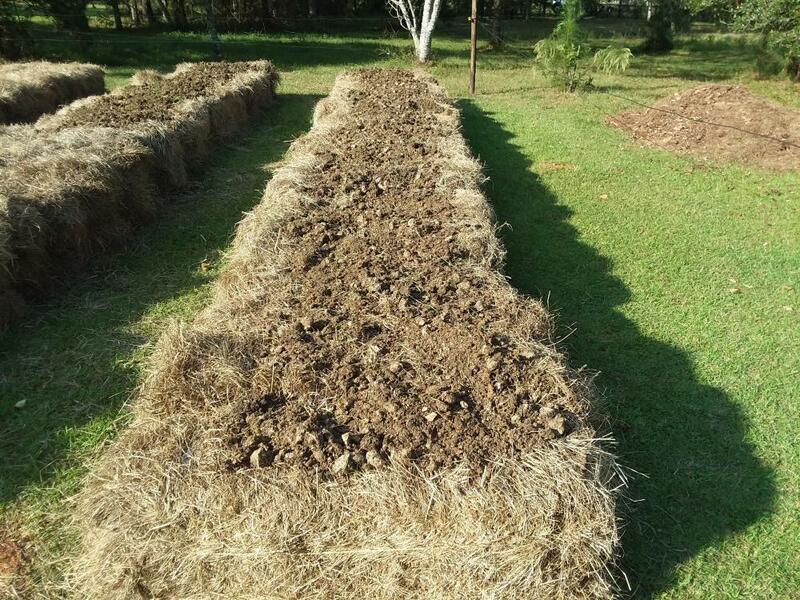 I do plan on heaping large quantities of organic material onto and into the bales and the walkways as we go along. I'll be hauling in loads of (free) loose hay for this as well as to mix with manure, shredded leaves and nitrogen for compost. I may haul in some loads of official compost too. Another pre-emptive measure I'm planning on is picking up a 20,000 ft. length of poly baling twine to wrap and strap the bales for integrity. That's why I laid the bales differently than usual. I want to "unitize" the bales into a chunk. Only $27 for the baling twine. Bad part of all this is I may end up doing more work in the end than I would have done to build proper raised beds. 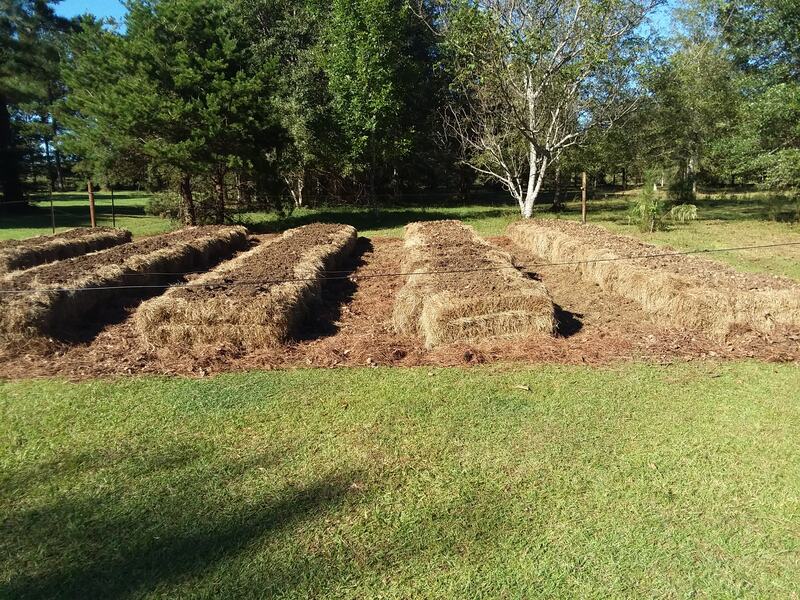 More optimistically, I'll do the same type of garden again in 2020 but stagger the bale rows into the walkways for rotation. After doing two garden cycles like this, I should have a pretty decent little patch covered very deeply with very nice organic material. At least that's the plan. I don't know about all that but I hear if you have a horse around here, that's what you have. 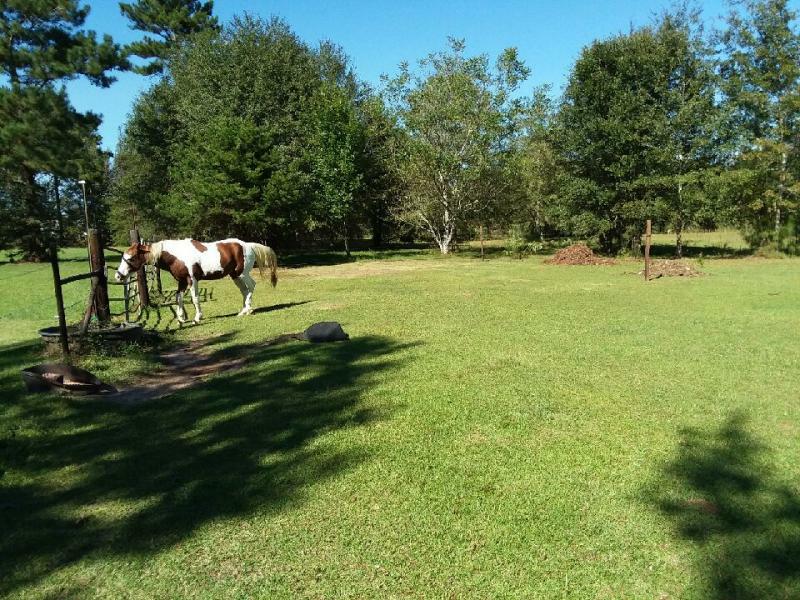 Supposedly the horse farmers have a hard time keeping the hippies out of their fields. 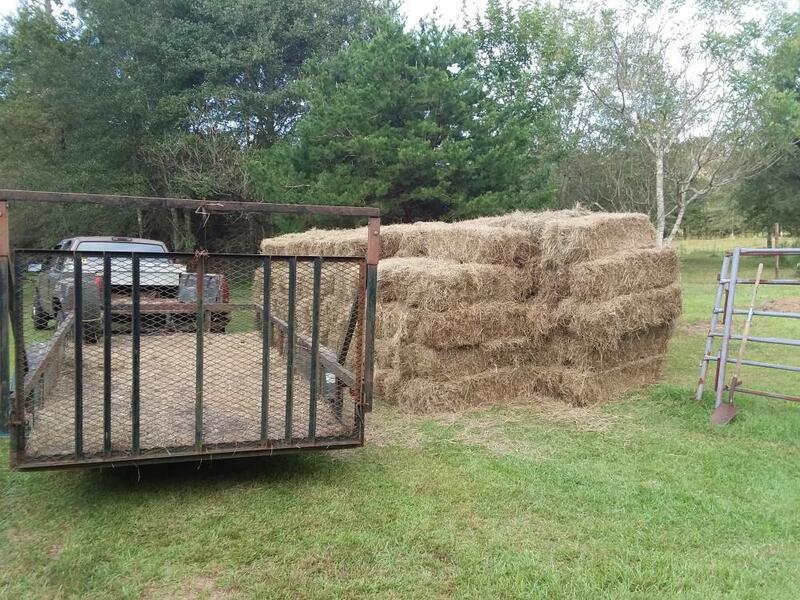 I picked up the first free load of "loose" hay yesterday. Much better than the mulch hay I was expecting. Every time he stuck his bucket into the pile when loading me, a big cloud of steam escaped. And it was about 70°F. 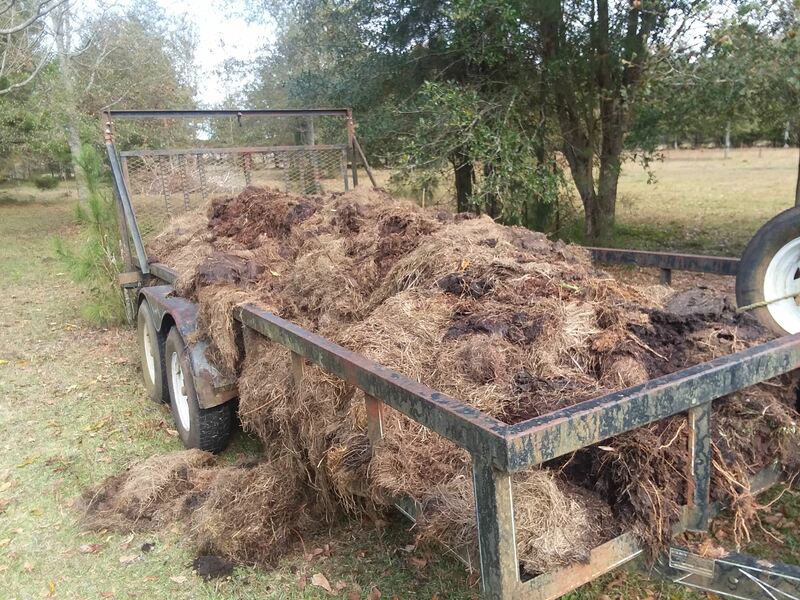 Old rotten hay with lots of sheep manure mixed in. Much of it is already nice compost but miserable material to unload with a fork. It's like a 5 ton brillo pad. Good stuff , just be careful , some sheep manure can be quite strong . Should be great mixed with other compost and hay. For now, I still have the same plans for this stuff as for dry mulch hay I thought I was getting even though this is a much richer amendment. 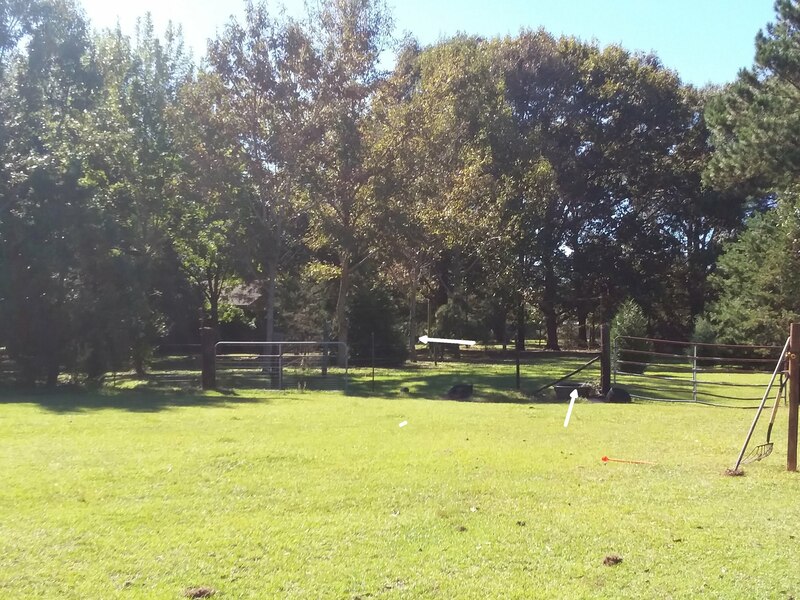 A left-handed benefit of all our hardwood trees is tons of leaves. Now that they're falling, I'm filling in the walkways with massive piles of leaves. Once they're all compacted down, I plan to use this stuff to fill in on top of the leaves and let it all continue composting. But as nice as this stuff is, maybe I'll go get a load of loose loft hay from the farmer where I got the bales and use that for the mulching and leave this stuff piled to finish composting down into really good stuff. be a money plot - nuttin' but good growin' there!